The ASK education delivery model has prepared JECRC University students to equip for tomorrows corporate world and has synergized with the Industry requirement says Rakesh Bhaskar, Vice President-Corporate Communications, JECRC University. Engaging and aligning with corporate requirement has enabled JECRC University in delivering quality education. The University has a long standing relationship with the Industry and have continuously being interacting with the Industry to understand the need and gaps in higher education and have explored options for a systematic up gradation in the delivery process. The University pedagogy has been designed on the principles of delivering and mentoring the students with –“Attitude, Skill, and Knowledge-ASK Model”. During the course of study, the students are motivated to develop the right attitude with specific industry skills and strong domain knowledge. Shaping and guiding the students with the right attitude, developing skills as per their career goals and aligning with the industry knowledge has been the guiding principle while planning the pedagogy of JECRC University. The University has initiated several methodology keeping in mind the ASK Model while designing the curriculum. One of the major initiatives taken by the University is empanelling Industry professionals in the University-Board of Studies (BoS). This has helped in synchronization the industry requirement with the University pedagogy. Another initiative is the industry collaboration and setting up of Labs in the University campus. 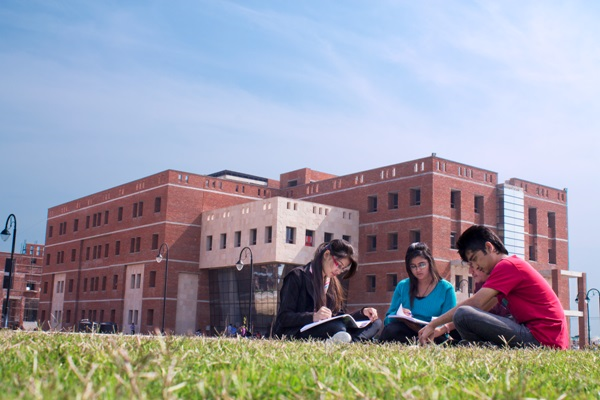 The University houses some of the finest resources like the Microsoft Innovation Lab, INTEL Lab, IBM Lab, CADD Centre, Computational Simulation & Enabling Technology (CSET) Lab and Wipro-Mission 10X. Industry experts continuously interact with the students through seminars, conferences and internship thereby keeping abreast with the latest industry knowledge. Talent development has accelerated the student’s performance with the required skill sets with the in-house facilities like the students Techno Club, Cultural & literary club and through participation in Inter University competitions and other international technical competitions. JECRC University provides a robust environment for the students for global exposure through Global Outreach Programme. The students are also encouraged to study foreign languages and provided with excellent opportunities for global internships. Kaizen model on Continuous improvement is followed at JECRC University. JECRC University is the Nodal Centre for National Institute of Technical Teachers Training & Research (NITTTR) under the Ministry of Human Resource Development, Govt. of India and provides extensive training programs in teaching methodology, evaluation, curriculum development, Research & Development, for faculty and staff of technical institutions across the state of Rajasthan. Disclaimer: The information provided in this Notification is solely by JECRC Foundation., Jagranjosh.com bears no representations or warranties of any kind, express or implied, about the completeness, accuracy, reliability, suitability or availability with respect to the information. Individuals are therefore suggested to check the authenticity of the information.